Rethinking Photography is an accessible and illuminating critical introduction to the practice and interpretation of photography today. 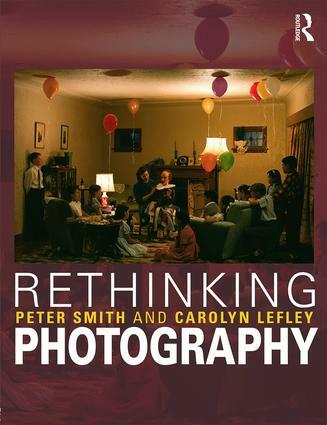 Peter Smith and Carolyn Lefley closely link critical approaches to photographic practices and present a detailed study of differing historical and contemporary perspectives on social and artistic functions of the medium, including photography as art, documentary forms, advertising and personal narratives. Focused and critical study of the world of working photographers beyond the horizons of the academy. Rethinking Photography provides readers with an engaging mix of photographic case studies and an accessible exploration of essential theory. It is the perfect guide for students of Photography, Fine Art, Art History, and Graphic Design as well as practitioners from any background wishing to understand the place of photography in global societies today. Peter Smith is a writer and lecturer with over 30 years of experience in teaching Art History and Cultural Theory. He has written articles and reviews for many journals including The Oxford Art Journal and Kunst und Politik. Recent publications include chapters in books including As Radical as Reality itself: Essays on Marxism for the 21st Century (2007) and Renew Marxist Art History (2013). He is currently a teaching at the University of West London where he was course leader for an M.A. in Photography. Carolyn Lefley is Lecturer in Photography at the University of Hertfordshire and a photographic artist. Her research interests include photography and expanded media: moving image, mobile photography and computer generated imagery. Her photographic practice explores notions of home, belonging and folklore.